Samsung has come up with Windows Phone 8 smartphone sporting 4.8-inch HD Super AMOLED display. It is a slim (8.7mm thick) phone with a brushed aluminum finish for elegant look. 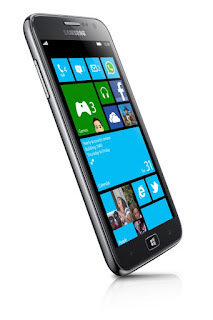 It dedicates a physical Windows button for useSamsung has come up with Windows Phone 8 smartphone sporting 4.8-inch HD Super AMOLED display. It is a slim (8.7mm thick) phone with a brushed aluminum finish for elegant look. It dedicates a physical Windows button for users' convenience. New Samsung Atvis S is powered with 1.5GHz dual-core processor and 1GB RAM for super fast performance. For uninterrupted use, it is fueled by a 2300mAh battery. Its 8MP rear camera gives users power to capture crystal clear images. It also has a 1.9MP camera on front for video chat. Samsung Atvis S Windows Phone 8 feature internal flash storage with optional versions of 16GB and 32GB, further it dons a microSD slot for more storage. Ativ Smart PC with 11.6-inch display, 128GB storage, 2GB RAM, Intel Atom chip, microHDMI ports , one USB 2.0 port , miniSD card slots, 8MP main camera, 2MP front camera, Samsung’s S Pen, and preloaded with Samsung’s S Note applications. Ativ Smart PC Pro will also be 11.6-inch device with 256GB SSD, 4GB RAM, USB 3.0 port, microHDMI ports, miniSD card slots, 5MP main camera, 2MP front camera, Samsung’s S Pen, and preloaded with Samsung’s S Note applications.